Gaeta is one of the most beautiful cities in south-central Italy's Lazio region, but you won't find it in many guidebooks. That's primarily because Gaeta does not have a train station. In spite of this, it's an extremely popular summertime destination because of its seven fabulous beaches. Locals and Italians from all over the country flock to these beaches to soak up the sun and watch surfing events. Whenever you visit, you'll find plenty to do, from hiking Monte Orlando to seeing ancient ruins to wandering the old, narrow streets to shop and eat. 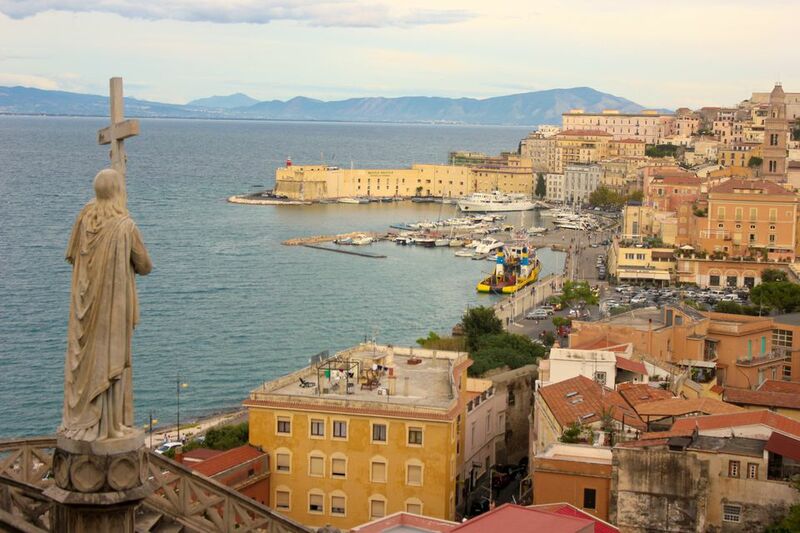 Plus, because it's in the southern end of Lazio, visiting Gaeta is a great way to get a taste of southern Italy – great food, friendly residents, tons of ambiance and a sense of history that ties everything together. Gaeta is one of the southernmost cities in the Lazio region, the region surrounding Rome (see Southern Lazio map). It's about 58 miles north of Naples on the coast road, Via Domitiana (road number SS7qtr). Situated on a peninsula that juts into the Tyrrhenian Sea, it occupies a strategic location on Italy's west coast. The closest train station is in Formia, reached by train from Rome or Naples. A city bus runs from the train station into Gaeta at least every half hour from 4:30 AM to 10:00 PM. Driving is a good alternative except during August, when beachgoers traveling from Rome and Naples bring traffic to a standstill. The closest airports are in Naples and Rome (see Italy airports map). Gaeta has a good bus system, but if you stay downtown you probably won't need it except to visit one of the famous beaches outside of town. Bus line B takes you from Piazza Traniello to Sant'Agostino, Gaeta's surfing beach. You can also take a taxi – perhaps from your hotel to the old city or to Monte Orlando. If you arrive by car, be sure to pay attention to parking regulations. Gaeta's tourist information office is in Piazza Traniello, also the local bus terminus. It's just a few blocks' walk from the old city, on the tip of the peninsula. You'll probably find at least one English-speaking person at the tourist office because Gaeta is home to the U.S. Navy's Sixth Fleet flagship. If you're arriving by car, Villa Irlanda Grand Hotel, in a former convent, is a luxurious option. (Tip: Summer weekends are often booked by wedding parties, lasting well past midnight.) Near the old city, Hotel Gajeta, on the Lungomare, is a reliable hotel in a historic building. The Lions Residence, operated by the English-speaking Viola family, rents apartments with small kitchens by the day or week – perfect for budget-conscious travelers or families wishing to prepare their own meals. If you're looking for seafood, you've come to the right place. Most Gaeta restaurants specialize in dishes featuring local fish and shellfish. You'll also see plenty of Gaeta olives, known worldwide; they come from the nearby town of Itri. Locals will tell you that Tiella di Gaeta is a must-try dish. Tiella looks like it was prepared in a springform pan and has two crusts. It's stuffed with seafood, vegetables or a combination of the two. Pizza is popular in the evening; most pizzerias open only at night because it's too hot during the day to fire up the pizza oven. The old city is packed with restaurants, but you'll also find good food in hotels and the newer city. If you're craving lasagne, head to Atratino at Via Atratina 141. This upstairs restaurant serves excellent baked pasta and some waiters speak English. In old Gaeta, a favorite is Calpurnio, a tiny restaurant at Vico Caetani 4. Calpurnio sets up outdoor tables during the summer; the simple menu features seafood dishes and pizza. Hotel Flamingo serves up tasty pizza, too. If you're looking for an elegant beachfront restaurant, head to Cycas at Via Marina di Serapo 17. Festival season kicks off with Pasquetta, Easter Monday, more of a pilgrimage day than a boisterous event. Pilgrims flock to the Holy Trinity Sanctuary on Monte Orlando on this day; stay away from this area unless you love crowds and tour buses. Gaeta's patron saint, Sant'Erasmo, protects sailors and fishermen. His feast day, June 2, isn't enough for this seagoing town; along with the nearby city of Formia the weekend closest to June 2 is dedicated to fireworks and celebrations. Sant'Agostino Beach has surfing contests during summer. New Year's Eve is celebrated with local musicians and fireworks that sparkle up and down the coast. If you're in town for New Year's Eve, book a room with a view; you'll see fireworks south all along the beaches. Gaeta's seven beaches are deservedly popular, with sparkling water, white sand and well-run lidos (pay-to-use beaches). Most visitors head to Serapo Beach, the closest to downtown. Surfers know that the best waves (and sunsets) are found at Sant'Agostino Beach, north of town, served by Bus Line B.
Monte Orlando, the prominent hill separating new Gaeta from the old city, has been designated an urban nature park. Hike to the top for stunning views of the sea. You can hike to the top for stunning views of the sea. On the mountain, you'll also find the ancient Roman Mausoleum of Lucius Muniatus Plancus. Don't miss Montagna Spaccata, or Split Mountain, on Monte Orlando. To get there, enter the Sanctuary of the Holy Trinity, a monastery complex run by the missionary P.I.M.E. Fathers. Look for signs to the Grotta del Turco (Grotto of the Turk) and follow the crowds. The cliffs overlooking the sea are split from top to bottom. Locals say that the mountain was cleaved in two at the moment Christ died on Calvary. Take the path down to the Grotto to visit this cavern, carved out of the mountain by the sea itself. The Capella d'Oro (Golden Chapel), a chapel in the Annunziata church, was made famous by Pope Pius IX. He was in exile here in Gaeta when he officially announced the dogma of the Immaculate Conception of Mary from this chapel on December 8, 1854. Gaeta's tiny old city offers something for everyone. Stroll along the Lungomare (sea road) and watch fishermen ply their trade. Look up and see the walls of the Angevin-Aragonese castle, thick and strong, high above the city. (Unfortunately, you can't visit the castle because the Italian military uses it.) The Romanesque bell tower tucked away between buildings in the old city, was built in 915. Walk right up to it and look closely at the building materials. You'll see blocks with carvings on them. Thrifty builders re-used items from ancient structures when they erected the tower. Be sure to stop for gelato at Il Molo or El Tiburon, at the far end of the old city in Piazza del Pesce.